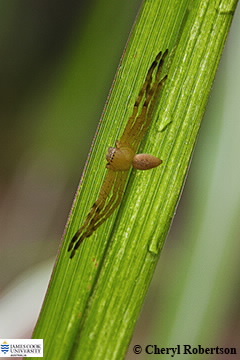 This juvenile huntsman was photographed on a leaf of Megathrysus maximus (Guinea grass). Possibly a juvenile of Neoparassus sp., these spiders are common in the area. Huntsman spiders are readily recognized by the jointed legs which can extend out from the body 'crab-like'. Adults are large up to 10 cm or more in width including legs. Body is usually hairy and a dull light to dark brown colour. They will bite if provoked but are not regarded as deadly.